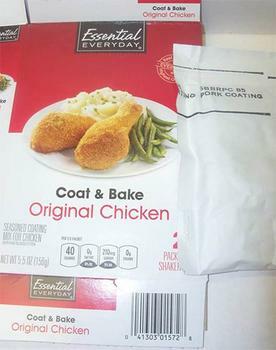 Gilster-Mary Lee of Perryville, Mo., is recalling one lot of Essential Everyday Coat & Bake Original Chicken coating. The product may contain milk, an allergen not declare don the label. The recalled product, packaged in 6-oz. Cartons with a Best By date of NOV 15 18 D04 (UPC# 41303-01572), was distributed to SUPERVALU distribution centers in New Stanton, Pa., Fort Wayne, Ind., Urbana, Ill., and Anniston, Ala.
Customers who purchased the recalled product should return it to the place of purchase for a full refund. or discard it. Consumers with questions may contact the company at 618-826-2361 ext. 3283 or 3035; or 573-547-8345 ext. 2035 from 8:00 am to 4:30 pm (CST) Monday - Friday.